Abbass Berjaoui, a second-year student pursuing a bachelor’s in biology, is no stranger to the consequences of health disparities. It’s the reason he was compelled to create MedEq: Medical Equity at Wayne State. MedEq is a nonprofit student organization that aims to reduce health disparities and promote equity in the healthcare system. Berjaoui, 20, was living in Lebanon during the 2006 Lebanon War. Seeking refuge in the mountains, Berjaoui and many others were without access to many basic living essentials. When he developed a severe fever, a trip to the hospital was not an option. “If you left the area you could die, so a bunch of doctors from the community held a free clinic. They gave me the medication I needed and, in a way, they saved my life,” said Berjaoui. Food and hygiene items were a scarcity for those seeking refuge with Berjaoui. When a bus from Switzerland came to deliver donated supplies, items like toothbrushes were celebrated. “Those little things that people don’t think will make a difference can make a huge difference in someone’s life. I understand that, and that's why I want to make a difference in my community,” said Berjaoui. 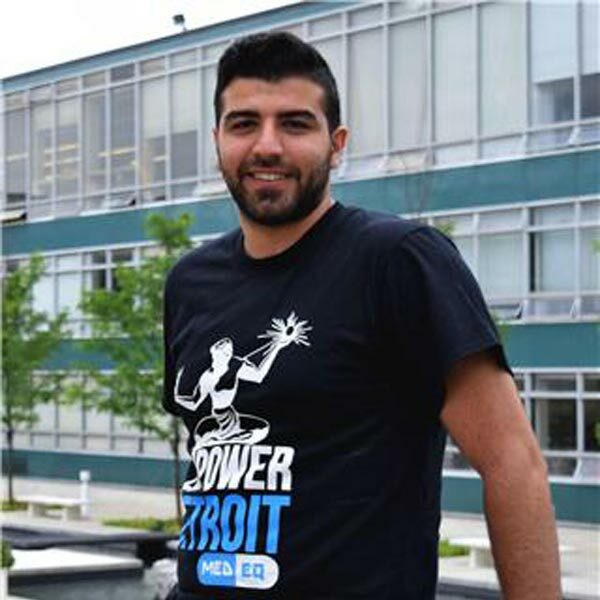 After noticing the health disparities facing Detroit, Berjaoui created MedEq as a way for students to get involved and combat those problems. “Wayne State should be one of the leaders in fighting health disparity. President Wilson already takes a lot of initiative with it, but I wanted to create a student-led initiative to support the faculty,” Berjaoui said. One of the largest hurdles to overcome was the complexity of health disparities. Berjaoui understood that it is a broad issue, and worked with his board to break down health disparities into six project groups: Environmental Health, Mental Health, Social and Community Context, Oral Health Disparities, Effect of Education on Health, and Food Disparities. Students in MedEq decide which category they would like to work in and, from there, create a project focused on it. Everyone should be able to live a healthy life, and I want to help ensure that. Since its founding, MedEq has worked on a number of projects in Detroit. In addition to hosting events to educate people on health disparities, members have held yoga sessions for students, organized FASFA workshops in Detroit Public Schools and built rain gardens. By dividing their efforts across specific categories, MedEq’s student members can efficiently improve the overall health of the Detroit community. Berjaoui does not want the mission of MedEq to end with Wayne State. In the future, he hopes to help expand the organization to other schools and is currently working with the University of Michigan-Dearborn and the University of Detroit Mercy to create new chapters. Berjaoui hopes to continue working to combat health disparities. After completing his degree, he plans to have a more direct impact on the community by leading free clinics.